Diaz in her art studio at the Guild of Exceptional Children. BROOKLYN — Bonnie Diaz fights as hard for her individuals as she does for her union members. 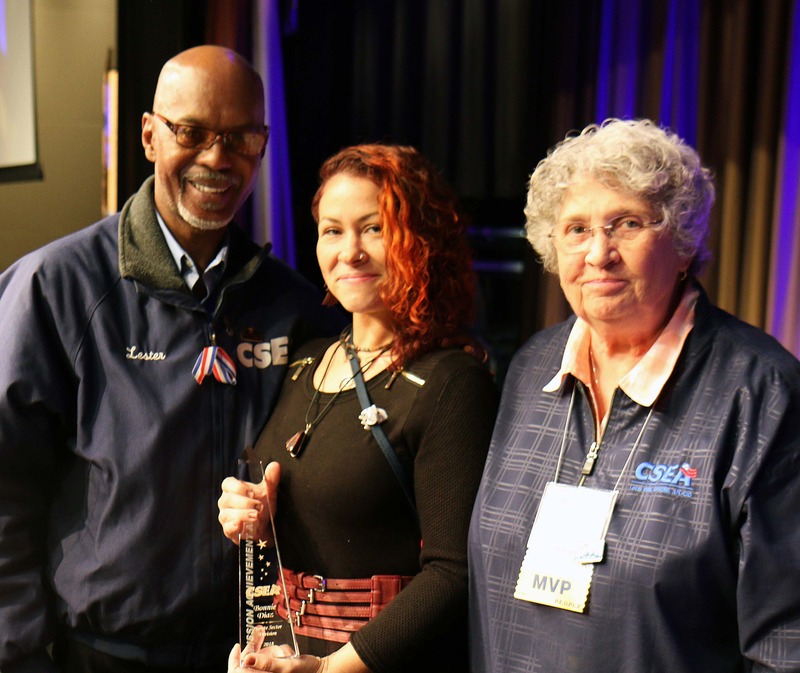 Diaz recently received CSEA’s Private Sector Mission Achievement Award for her work and leadership as president of our Guild for Exceptional Children Local. Hard work has helped Diaz achieve many goals at work and in our union. What began as a part-time position working nights in a residence soon evolved into a full-time position when she insisted on obtaining a position with full time hours. Then, our union came knocking at her door. As a private nonprofit, workers at the publicly-funded Guild enjoyed few rights and protections. Favoritism, intimidation and arbitrary promotional opportunities were the norm. Diaz liked what she was hearing from our union and felt a calling. “I was a Goth metalhead and they wanted someone who was willing to confront management and willing to speak up,” said Diaz. After waging a successful organizing campaign, Diaz was involved in negotiating the Guild local’s collective bargaining agreement and became the local’s first secretary. “Making sure that the individuals are getting what they needed and listening to my members and making sure they get what they need,” have taken on a greater urgency for Diaz. A self-taught artist, Diaz became the Guild’s Art Director several years ago and now has one of the most sought-after assignments for individuals at the Guild. Throughout the day, she works with individuals from the ages of 21 to 81 on projects that range from ceramics, painting, sculpting and other multimedia creations. She prefers working with recycled materials and has created materials for use by other programs within the Guild. As a union leader, she’s also aware of the changes she’s undergone. She’s the Metropolitan Region representative on our statewide Next Wave Committee and chairs her region’s Next Wave Committee. The Next Wave Committee engages potential new CSEA activists. “Working with Next Wave has helped me build the person that I am now and nurtured the leadership role that I play now,” said Diaz. In the new year, Diaz said she’ll continue reaching out to new and young members to get them involved and allow them to see the importance of union membership. Improving health care benefits is another priority. Not having any leave time to take care of union business is something she’d like to change as well. “It’s vital to have a connection with our membership in order to keep this union going strong,” said Diaz. Fully aware that these issues like many others she’s tackled in her life and career will be challenging, Diaz maintains that she’s ready for the fight.